Kongsberg Group’s (KONGSBERG) acquisition of Rolls-Royce Commercial Marine sent shockwaves through the industry. From seemingly out of nowhere, the Norwegian headquartered global leader in control, positioning, safety and automation acquired one of the biggest names in ship design, deck and rotating machinery. 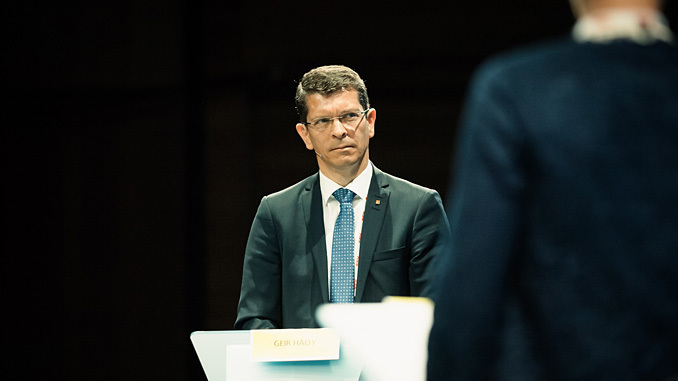 On the eve of the official takeover, 1 April, KONGSBERG group CEO Geir Håøy explains both the rationale behind the purchase and what lies ahead. It’s that simple. When Geir Håøy, previously the CEO of Kongsberg Maritime and now KONGSBERG group CEO, is asked about the motivation behind the approximately GBP 500 million purchase of Rolls-Royce Commercial Marine, that’s the answer. One word. And a smile. End of interview? Thankfully, after a rather long second, he elucidates. And then there’s the “scale”. Everything about this acquisition is big. The money, the turnovers (Rolls-Royce Commercial Marine’s was NOK 8.9 billion in 2017, while KONGSBERG’s was NOK 14.5 billion), the global networks (KONGSBERG has operations in 25 countries, Rolls-Royce Commercial Marine 34) and the people, with the purchase set to add 3600 new staff to KONGSBERG’s existing 7000. And let’s not forget the market share. A fit that, as maritime continues to evolve, Håøy believes will become increasingly seamless. Together KONGSBERG and Rolls-Royce Commercial Marine will provide a vast menu of options for customers, ranging from KONGSBERG’s market leading dynamic positioning and sensor-based technology, through to Rolls-Royce Commercial Marine’s cranes, deck machinery and, as revealed in a test with Finland’s Finferries in December last year, fully autonomous berth-to-berth vessel systems. Håøy says the combined firm is ideally positioned to be a “trend setter” and enabler for the shipping industry, helping it move forwards and take advantage of future business opportunities. Although the new firm comes into being on 1 April, Nor-Shipping, taking place in Lillestrøm and Oslo between 4 and 7 June, will be the first opportunity for it to really connect ‘face to face’ with the entire industry. 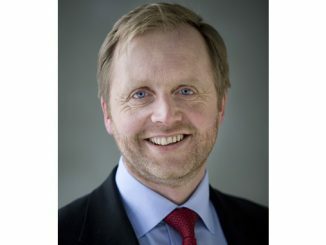 Håøy also believes Nor-Shipping’s new, wider focus – encompassing ocean industries as well as shipping – is good for business. Given the dire conditions much of the maritime industry – and particularly the offshore segment, where both Kongsberg and Roll-Royce Commercial Marine have leading positions – have experienced, a devil’s advocate may suggest the acquisition represents somewhat ‘risky business’. Håøy doesn’t seem perturbed by the suggestion. Håøy says KONGBERG’s unique group structure, with domain expertise in defence and digital, alongside maritime, will also help the enlarged firm prosper going forwards. He speaks of “considerable synergy” across the divisions with technology and knowledge transfer seemingly commonplace. “The speed of development on the civilian side helps create innovation we can utilise in defence, while defence technology can be exploited for civilian purposes,” he notes. 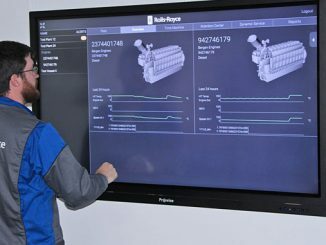 Here he nods towards the much-anticipated Yara Birkeland autonomous ship project as an example, which features sensor technology from KONGSBERG’s military applications. 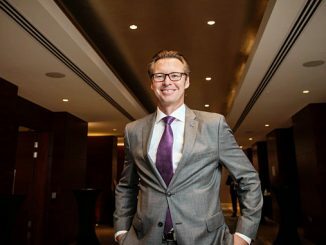 Despite his optimism with regards to future opportunities, the group CEO is candid about the challenges of bringing together two such large, established and renowned brands and companies under one corporate umbrella. It is, he admits, no simple task. As it is for the industry as a whole. There’ll be a lot of observers keen to see how the acquisition plays out and how the combined firm will expand its reach across a rapidly developing maritime, and ocean industry, sector. As such, at Nor-Shipping 2019 you can expect Kongsberg Maritime’s stand to be both one of the biggest, and the busiest. The “growth” Håøy speaks of relates not just to the business and its asset footprint, but also to industry interest.